HMS Queen Elizabeth has arrived in the United States after successfully crossing the Atlantic. The nation’s biggest-ever warship has arrived at its first port of call in Mayport, Florida, yesterday (September 5). She left Portsmouth on Saturday, August 18, to sail on her historic trip to America for flight trials for the F-35B stealth jet. Hundreds of people were on hand to wave the 65,000-tonne aircraft carrier off as she sailed out of Portsmouth Harbour just over two weeks ago. After 18 days at sea HMS Queen Elizabeth successfully crossed the 3,400-mile trip across the Atlantic and made it to America. The warship is on a landmark 11-week deployment off the east coast of America. And the milestone mission will see the first landing of the F-35B, the UK’s new stealth jet, onto the enormous flight deck of the 65,000-tonne leviathan. Eight years after a jet last took off from a British aircraft carrier. The flight tests will take place at the Integrated Test Force (ITF), which is based out of Naval Air Station Patuxent River, Maryland. HMS Queen Elizabeth has stopped at Mayport, Florida, for a re-supply and still has a fair bit of sailing to do before reaching Maryland, which is further up the East Coast. 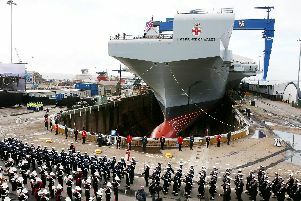 The historic first landing on the HMS QE is earmarked to take place towards the end of September. About 200 supporting staff, including pilots, engineers, maintainers and data analysts will be joined by the test jets, which are expected to conduct 500 take-offs and landings. Special sensors dotted around the ship will monitor each landing and take-off to work out the operating parameters of the aircraft and ship in a range of conditions, night and day. These follow similar successful trials which were conducted by HMS Queen Elizabeth at sea earlier this year for rotary wing aircraft. Four F-35B Lightning developmental test pilots, who are members of the ITF, will embark to fly the aircraft; three British and one American. The British personnel comprise a Royal Navy Commander, a Squadron Leader from the RAF and one civilian test pilot. They will be joined by a Major from the US Marine Corps. Nobody yet knows who will be the pilot to land the first jet on the £3.1bn supercarrier, but naval top brass said it would almost certainly be a British pilot. The trials follow the recent arrival into the UK of the first four joint Royal Navy, Royal Air Force F-35B jets, based at RAF Marham, earlier this year with the latest five jets arriving little more than a week ago.